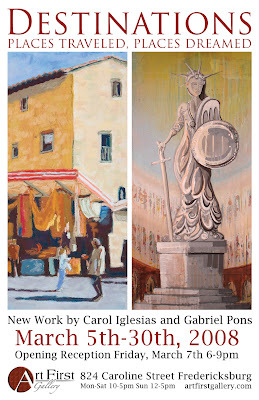 I am excited to announce my upcoming show with fellow Art First member Carol Iglesias. "Destinations: Places Traveled, Places Dreamed" will feature new work which is inspired by sites both visited and imagined. Carol Iglesias’s paintings are comprised of scenes from various Italian hillside towns throughout Tuscany that she had visited last October. Her travel itinerary included fifteen days of “plein air” (outdoor) painting and sketching in scenic towns like Volterra, San Gimignano, San Casciano, as well as Florence. The locations alone pushed her artistic skill while providing an abundance of inspiration at the same time. The result is a cohesive set of compositions, executed in pastel, which resonate with color, texture, and life. My work references historic art and architecture yet is executed in a contemporary style. My latest mixed media compositions explore abstract architectural spaces where cityscapes and structures are constructed from scraps of magazines, acrylic paint, stencils and ink. My recent series of paintings experiments with figurative forms and their placement in a surreal and imaginary landscape.